The Mountain Floral pine waterbed mixes the fine styling of dentil molding, the function of large storage cabinets and the privacy of a lift top jewelry box to create the perfect blend of features. 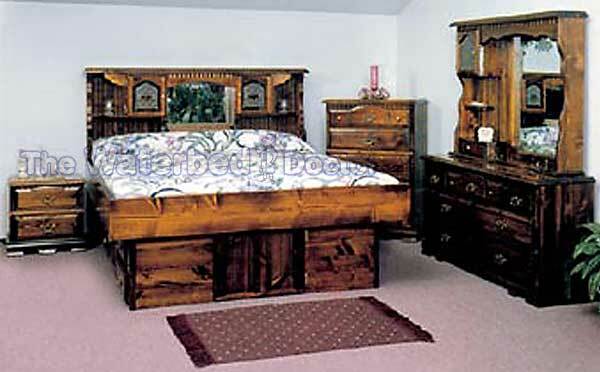 Includes headboard, frame, deck boards, 9.25" Standard Pedestal. (Shown with optional 18" Captain's Pedestal available below). Available in Honey Oak, Unfinished or Walnut finish. BUILD YOUR BED HERE USING DROP DOWN SELECTIONS. The Mountain Floral headboard comes with frame, deck boards, Standard Pedestal. FREE Free Flow Mattress, Fill & Drain Kit, Liner & Heater. All Made In The U.S.A.